A dramatic start to the day with those early morning skies I posted. Other than being milder, chores were nothing out of the ordinary. Barb has me totally spoiled since she has been helping me everyday for over a week (during her vacation). The weatherman said it hit 51 degrees today. Took the blankets off the ponies to give them a chance to do whatever. Barb made sure we removed any manure that was missed in the paddock when it was full of snow. At this rate, there should be no white stuff by morning. Then I drove down to the car wash.
My car is now temporarily clean...inside and out. Back at the ranch...more and more snow was melting. Part of the time it was grey and part of the time it was sunny. The ponies rolled in the indoor and stayed clean....except for King Mustafa! He decided to roll in the soaking wet outdoor arena as well as out back. Barb had chore duty tonight, so I sat by the fire reading magazines. Dinner was easy. I defrosted Swedish Meatballs from Christmas Eve and turned it into Swedish Meatball Stroganoff. Served it with green beans, a carrot and apple salad (too lazy to go to the store for greens), and pickled beets. It's not even 7 o'clock and I'moutahere! Don't know about you, but we plan to hang tight this evening. No party time for the Skoogs. Quiet and peaceful sounds just right. After nearly a month of grey skies we have had two mornings in a row with some color. 7:15-8:15am at Skoog Farm....what a gift. To see more beautiful skies around the world, click on my sidebar. I can't remember when the sky was so beautiful in the early morning. Today, we have broken out of the grey mode. Thought I would post these shots and come back later to finish. I introduced you to Claire, who is visiting from Spain....when she and her Mom (Deb) stopped up to the farm. 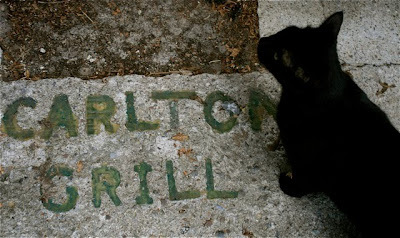 Today 14 of us went out to the Carlton Grill for lunch so she could try one of our favorite restaurants. She, Topper, Janice and I took many pictures. After listening to the specials, half ordered the pastrami sandwich with some of those homemade fries (crispy). Deb and Tom are Claire's parents. You already know Carol and have seen at least 25 pictures like the one below....Topper taking a picture of me taking a picture of him. At the beginning, we had the whole place to ourselves. There's nothing like good friends and food....all in the same place at the same time. I'm sure Claire has documented her visit well. What a pleasure to have met her! Sorry there has not been more time to spend together. She is right up my alley. If I ever get any of you to visit this neck of the woods, we are going to the Carlton. Chef Steve appreciates our visits and takes good care of us. Tom had to leave early for a piano lesson and Topper went to Medina, so we drove Carol home. You've been here before too. I took tons of photos when Helen was visiting from Scotland and another time when we were there with Jenny and the boys. Remember? Boating, swimming....trying out the new kayak? They have grass showing and we still have a few inches of snow. The temperature was in the low 40s today, so ours will melt if we are lucky. Tomorrow 48 and Saturday 53. We shall see. This is what the beach looked like today. Lake Ontario is very deep and never freezes over. Below is a piece of art created by the waves and ice on the sand. Home in time to relax a little before doing chores. It was a beautiful evening but I did not have the energy to take my camera back out. So that's it for now....Night all. LOOK WHO'S RIDING TODAY IN GERMANY! THE SNOW HIT THE FAN! COLD, BRIGHT....AND IT DIDN'T SNOW!!!! GOT A MINUTE OR 40?